Goodreads: Were you a sherbet lemon or chocolate lime fan? Penny chews or hard boiled sweeties (you do get more for your money that way)? The jangle of your pocket money ...the rustle of the pink and green striped paper bag ...Rosie Hopkins thinks leaving her busy London life, and her boyfriend Gerard, to sort out her elderly Aunt Lilian's sweetshop in a small country village is going to be dull. Boy, is she wrong. Lilian Hopkins has spent her life running Lipton's sweetshop, through wartime and family feuds. As she struggles with the idea that it might finally be time to settle up, she also wrestles with the secret history hidden behind the jars of beautifully coloured sweets. 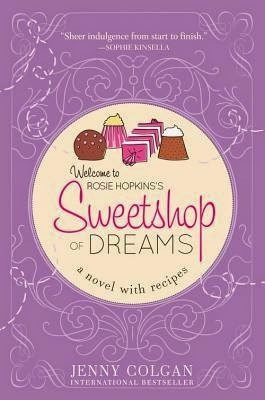 Welcome to Rosie Hopkins' Sweetshop of Dreams - a novel - with recipes. Kritters Thoughts: Two story lines in two different time periods and thankfully they came together just perfect at the end. Lillian is an elderly woman who never left the hometown that she was born and raised in and never married, she tells her story of her adolescence and young adulthood in this small town. Rosie is her niece and has moved to this small town to help her great-aunt settle her affairs and move her into an elderly home, she may fall deeply in love with this small town. I loved the mix of historical as Lillian's story was in the middle of war time as the men are being called to fight and the modern storyline with all the fantastic feels of a small town just trying to make it by. Rosie was a fantastic character to tell her story, she wasn't too whiny and showed resilience and tenacity. It was easy to want to root for her and hope that she finds happiness. My one hiccup with this book was the repetitiveness at times. There were a few moments where I felt like the author copied and pasted and it made me feel like as a reader I was being reminded a few too many times how the character was feeling.